Photo above: Environment Committee Chair Kumar Barve explains his support for the rain tax repeal. A lone legislator let his disapproval rain down on House delegates the last night of session, as the Watershed Protection bill passed with only Del. Richard Impallaria opposed against 138 members. Impallaria was alone standing in opposition to SB 863, the Watershed Protection and Restoration Program, sponsored by Senate President Mike Miller to allow counties and municipalities to regulate their own stormwater fee. Miller’s bill replaced Gov. Larry Hogan’s simpler repeal measure, a key part of his legislative package. 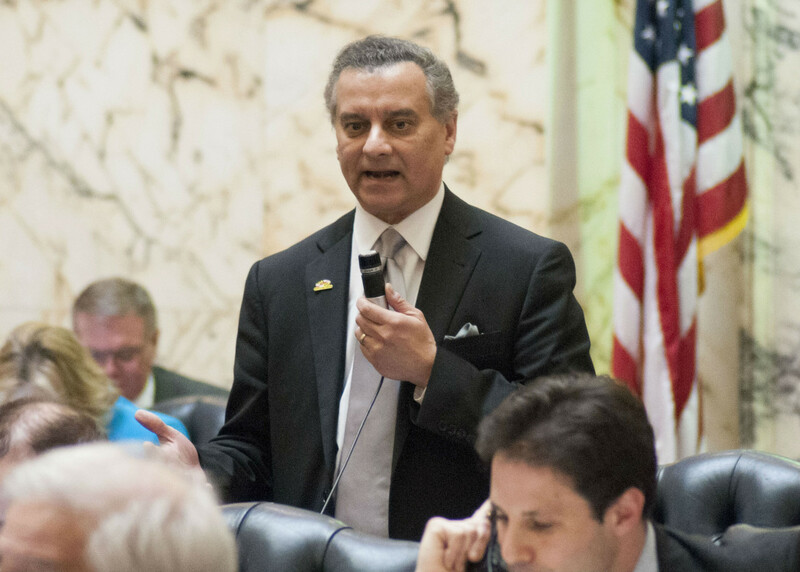 Impallaria fears that not only will small business owners suffer, but the fee, which he believes is highest in Baltimore County, will deter business from locating to the county. Impallaria is correct that the bill does not “repeal” the fee, according to the bill’s fiscal note. The counties will instead have the choice of how to comply with the federal stormwater management requirements, whether it be with a fee or other revenue sources. “This bill is not perfect, but it does change ‘you shall charge a tax’ to ‘you may charge a tax’,” said House Minority Whip Kathy Szeliga, R-Baltimore and Harford. Szeliga noted the success her county, Harford, has had paying for their stormwater fee through county general funds. All revenue collected from county fees will be deposited into the local watershed protection and restoration fund. Counties will need to report a five-year projection of costs and revenues, including specifying funding sources, for permit compliance to the Maryland Department of the Environment (MDE). Kumar adamantly supported the passage of the bill, with other legislators cheering him on from the House floor. “We, in this legislature, are not letting the Chesapeake Bay go down on our watch,” said Barve. “We were holding our breath for the past few days and hours. The stormwater bill is a remarkable victory. What a turnaround for Bay issues this session,” said Alison Prost, Maryland Executive Director for the Chesapeake Bay Foundation. The Stormwater Remediation Fee was established by House Bill 987 in April of 2012. The law affects the largest urban jurisdictions in Maryland, counties with the largest pavement for stormwater runoff. HB 987 was created to meet the requirements of the federal Clean Water Act. SB 836 passed 138-1 in the House before moving on to pass 47-0 in the Senate.